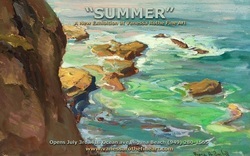 Summer 2014 For the California Museum Of Fine Art Exhibition. Rothe and VRFA artists join Dali Higa and CMFA artists for an 80 painting exhibition in Los Angeles CA. Vanessa Rothe co curator, and exhibiting fine artist. 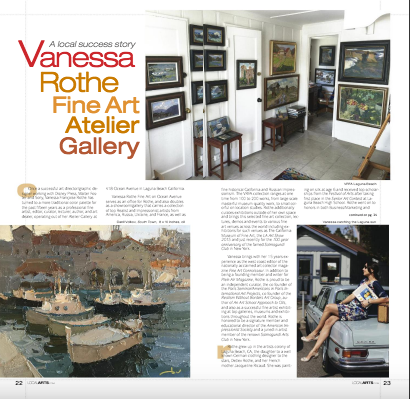 Vanessa Rothe Fine Art is proud to feature over 100 works of art by many of the world’s top artists with live demos, lectures, workshops, and more during a two-day exhibition and event. Fine Art Connoisseur West Coast editor Vanessa Rothe offers her thoughts on a new show of Impressionist art after an enlightening firsthand experience. 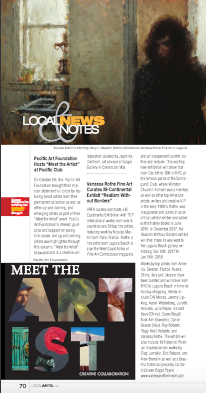 Huntington Art Center Exhibiting Rothe and VFRA artists alongside CA historical fine art. June 2015. CA. Mar 12, 2015 ... "Spring," a group exhibition featuring California and international painters, will open this weekend at Vanessa Rothe Fine Art and Atelier.